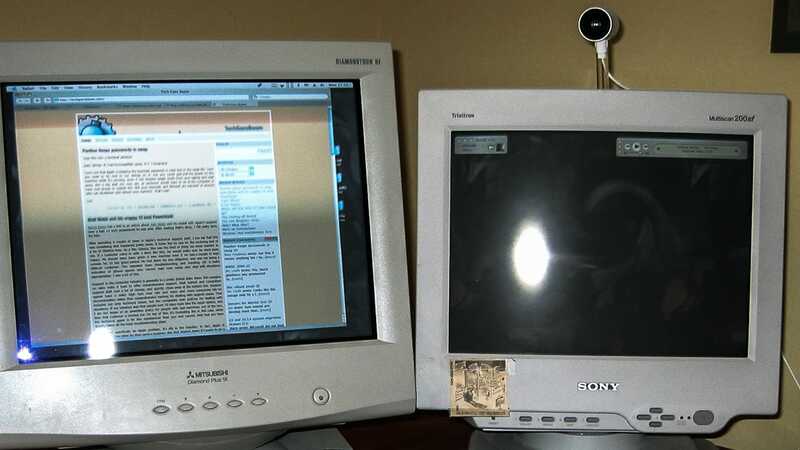 Mitsubishi 19" Diamondtron and Sony 17" Trinitron monitors back in 2004. Those were the greatest display technologies you could purchase at the time. And yes, cool people, you are correct: that’s a FireWire iSight camera perching on the Trinitron. Probably the biggest hurdle with new technology is that it requires people to change to get the most out of it. When you adopt a technology to help solve a problem—like, oh let’s say, team work—if you just drop the technology in people will use it like a faster version of the old technology. It’s analogous to what happens to new media: First there’s radio and then there’s TV, and TV shows are radio shows with a camera trained on them until enough time goes by that pioneers discovers the strengths of the new medium and develop it into its own thing. In offices today we’re still in the early part of that transition—we have better ways to do things, but they’re stuck in their old workflows. Like the dreaded e-mail chain, where everybody’s sending e-mails around like they’re little slips of digital paper. And then a document needs revising, so a Word document gets attached to the e-mails, like it’s a bunch of papers. There’s no sane reason to do this in 2015, but all over the world this happens in offices every day. Because it’s such a natural analog. You’re using new technology to make what you used to do faster and more efficient, but forcing it to conform to old habits. And in offices around the world, people open the Word file, read it, edit it, and pass it along, exactly like a piece of paper that gets marked up by different people. It may still be a win since sending e-mails is a lot easier, faster, and cheaper than couriering paper around, but it’s still the same old process, only turbocharged. The hard part about adopting a digital workflow isn’t to replace the manual tools—the hard part is to change the workflow. People fear change. Most people at this point have realized the benefits of using a word processor instead of a typewriter, but that doesn’t change the writing process, only the physical act itself. Which is profoundly sad—the state of computers and networks these days has the potential to revamp the process itself. One obvious technology that has been mature and ready for the masses for a long time is shared documents. Let’s use Google’s implementation as an example, since it’s free and polished. Google Docs lets you create and edit text documents, spreadsheets and presentations on the Internet, which is great for people who move between different machines a lot, or for people who simply want to be able to work on a document at work, then pick up where they left off at home without resorting to kludges like e-mailing themselves the document or remembering to put it on a flash drive. That’s a win, right there. But the real win is that other people can be invited to collaborate on the documents. So different people can change things at the same time. Which means no more e-mailing documents back and forth. No more having to figure out who has the latest version, or the even worse scenario of spending your time editing a document only to find out it’s several versions old and all your work was for naught. Not a good feeling, that. So why aren’t more teams using technologies like Google Docs when the benefits are so obvious? Because they require a new process. Why mess with something that works—well, that kind of works—but is grossly inefficient? This is the challenge for technologists and technology evangelists—getting people to understand why changing the entire workflow is sometimes necessary to get the benefits of the technology. It can be a hard sell. Lord, can it ever be a hard sell.